Posted in Bright Ideas / Research on March 18, 2016. There are an abundance of posts about the best practice & effectiveness of regular Adwords to drive traffic & leads to all types of businesses. But there are very few posts that specifically focus on Adwords Express (AWE) and examine its effectiveness for local businesses, its pros & cons & best practices for using it. Does Adwords Express provide good ROI for local businesses? Google has struggled to get small business owners to use Adwords because it’s complex. It requires both time & knowledge to make it work cost-efficiently, and small business owners are time-strapped folks! Adwords Express (AWE) is specifically designed for small, local businesses. It has a guided set-up process that makes it quick & easy to get up & running with paid ads on google. A business can target potential customers based on interests, location & language in just 3 clicks and put their advert live in under 5 minutes! Here are few key facts about AWE that you should know. To use AWE a business needs to have an active Google My Business listing. When you create an AWE campaign you first select the business’s GMB profile & then create the ad campaign. Once your campaign is running you can see top-level results displayed in your GMB dashboard & can click through to your AWE dashboard to see data on views, clicks & keywords. 2. Where do Adwords Express ads appear? They appear in all the places that normal Adwords ads appear – at the top of Google Search pages, on Google Maps pages & across the Google partner site network. AWE ads also look identical to normal Adwords ads, so there’s no telling them apart. 3. Is there a minimum budget & duration for running Adwords Express? The minimum budget is very low – approx $1.5/day or $45/month. You set a daily budget and Google converts this into a monthly amount. So your campaign will run for 1 month with your ads displaying each day until your daily budget is hit. At that point your ad stops showing until the next day when your daily budget renews. AWE also provides a guide to what your competitors are spending & the maximum size of your market. This gives an upper limit to your monthly spend which varies for each type of business & location. Does Adwords Express deliver ROI for Local Businesses? In March 2016 we ran an online survey of SMBs & Local Search marketers, asking them about their usage & experiences of AWE. We contacted over 2,000 people but only 305 completed the survey. The main reason for the low response rate is simple – not that many people are using AWE so can’t comment knowledgeably about it. The following 5 charts give a clear view of what AWE users think about it. How familiar are you with Google AdWords Express? Do you use AdWords or AWE for your business/clients? So it’s clear that many more people are using Adwords vs. AWE for reasons that we’ll explore below. Interestingly over 3x as many people found AWE to be unsuccessful vs Adwords. So far Adwords is the favorite ahead of AWE. How effective is AdWords Express at generating website traffic? Here we see why Adwords trumps AWE – AWE isn’t very effective at driving clicks for the majority of people who have used it. Just 4% of respondents said it was ‘very effective’ at bringing customers to their site – hardly a glowing commendation! One of a handful of tools that we couldn't live without. From Rank tracking, to citation bursts and tracking, BrightLocal is an invaluable local seo tool. 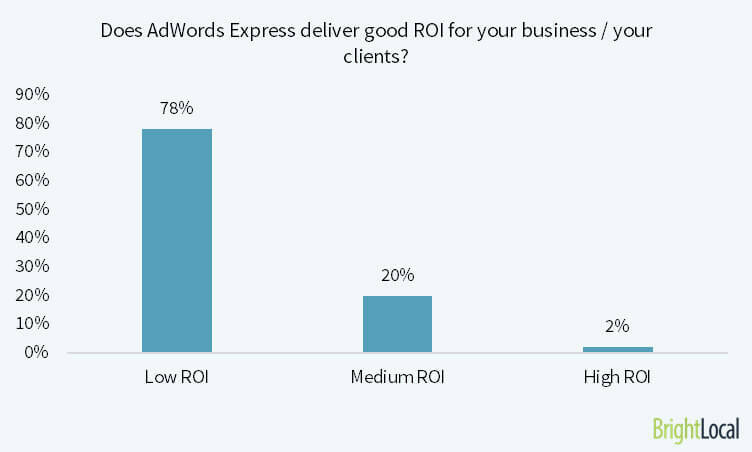 Does AdWords Express deliver good ROI for your business/clients? More fuel for the fire here! We already saw that AWE does a poor job of driving website traffic, and that translates through to ROI. 78% of people said that AWE delivers Low ROI. Ouch! Is AdWords or AdWords Express more effective for your business/clients? We have a clear winner – Adwords clearly outperforms AWE. 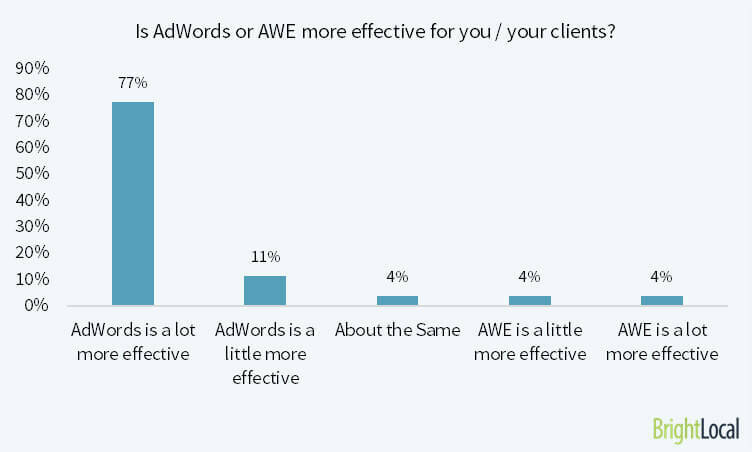 But 8% of people said that AWE outperforms Adwords. So clearly some people find success with it. Next we’ll examine the Pros & Cons of Adwords Express. In the survey we also asked respondents to tell us the best & worst things about AWE. We had a ton of great comments and I’d like to say a huge thank you to everyone who left comments – we salute you! Within those comments were a number of recurring themes which we have distilled down into main Pros & Cons of AWE. Is AWE it’s own worst enemy? Google designed AWE to be simple & make it easy for business owners to use. In doing so they stripped out many of the controls & targeting features that PPC practitioners use to optimize Adwords to make it cost effective. All of the ‘Cons’ above relate to the ‘missing’ controls & features. And without these controls it’s hard to make Adwords deliver positive ROI. So AWE is in a ‘catch 22’ situation. So where does that leave local business owners? BrightLocal makes our job as SEO specialists easier and faster. We would not be as successful without it. Best Practices for using Adwords Express to attract customers? So if you opt to give AWE a try then what can you do to give it the best chances of success? I turned to my friend & well known Local Search expert Joy Hawkins to find out, and this is what she said. Google provides some useful & concise documentation to help you use and get the best results from AWE. So before you jump in and commit to spending your hard earned dollars, take 30 minutes to read through the docs. Start here – Help Guides for Google Adwords Express. AWE is really only good for businesses who spend <$500/month on PPC. If you find yourself spending more, then you should seriously consider switching to regular Adwords and hiring a professional to help you optimize your campaigns to deliver better ROI. Google makes it easy(ish) to link your AWE account to Google Analytics. Doing this allows you to view the number of site visits & conversions generated by your AWE ads so you get a clear picture of performance. See how to Link Adwords Express to Google Analytics here. If you do link AWE to GA then you will see performance data for all the keywords that drive clicks via AWE. This is invaluable because you can identify poor performing terms & irrelevant terms. Once you have this data you can go back into your AWE dashboard and un-tick these terms so Google won’t use them any more. But the key is to do this regularly. Don’t do it just once and think you’re done. Google may introduce new terms into your campaign which don’t work for you. Ideally you should schedule a weekly review of your terms and prune the ones that don’t work for you. AWE has a neat feature that allows you to insert free call-tracking numbers into your ads. This enables you to track both clicks & calls for your ads so you get the total picture of how it’s performing. Disclaimer – Call reporting is currently only available in a limited number of countries – see more here. If you find success with AWE then great. This means that you can expect even more success using regular Adwords. At this time you might want to consider investing more and jumping over to Adwords. A huge thank you to all 305 people who participated in the survey. And a special thank you to Joy Hawkins from Imprezzio Marketing for her time & wisdom.